1) In a bowl add ingredients of marinade from 1 to 9 and mix well gently with a whisk or clean hand to make the marinade. Divide this marinade into two bowl, marinate chicken in one bowl and capsicum and onion in another. Set aside for atleast 1 hr. 2) Make a puree from tomato and cashews and set aside. 5) Now for making the masala, add oil in a pan and crackle the cumin seeds. 6) Add ginger-garlic paste and stir for a min. Add the onion and stir till light brown color. 7) Add salt, turmeric pdr, cumin pdr, coriander pdr chilly powder and stir well. Add 1/4 cup of water and cook till the masala absorbs the water. 8) Add the tomato-cashew puree, some more water and stir well. Close the lid and get it to boil. 9) Add the leftover fenugreek powder, chicken tikka, simmer the flame with lid on and cook it for 4-5 mins so that chicken absorbs the nice aroma of the gravy and gets cooked nicely. 10) Add the cream if necessary( i didnt add it bcse the gravy was very nice without the cream and i felt the spiceness will be reduced if i add it). 11) Move into a serving dish, garnish with cilantro and serve hot with Roti/Naan/Rice.. 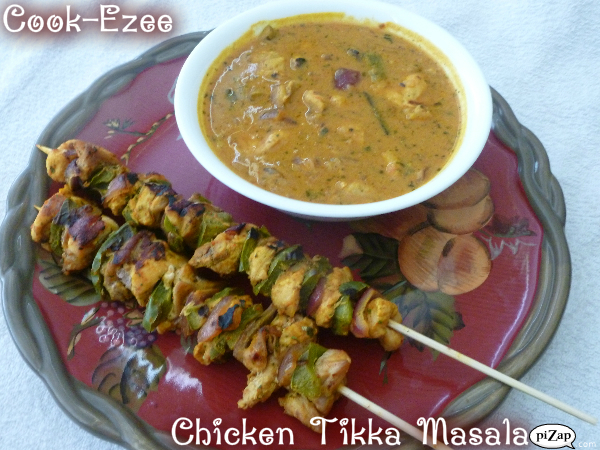 Note:- I have kept aside some skewed chicken tikka without adding them in the gravy. This ended up being another side dish on our dining table.